INDAR KUNWAR (of Balrampur), Maharani. Arms. 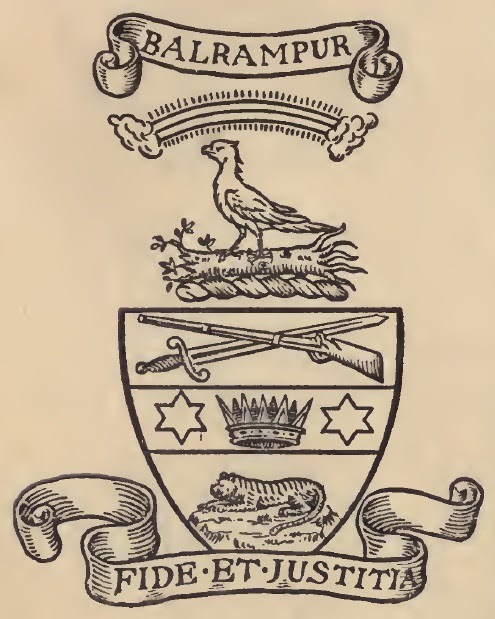 Argent, on a fesse azure between in chief a sword in bend surmounted by a matchlock in bend sinister, and in base on a mount a tiger couchant, all proper, an Eastern crown between two stars of six points of the first. Crest. On a wreath of the colours, upon a trunk of a tree eradicated fessewise and sprouting to the dexter, a falcon surmounted by a rainbow, all proper.